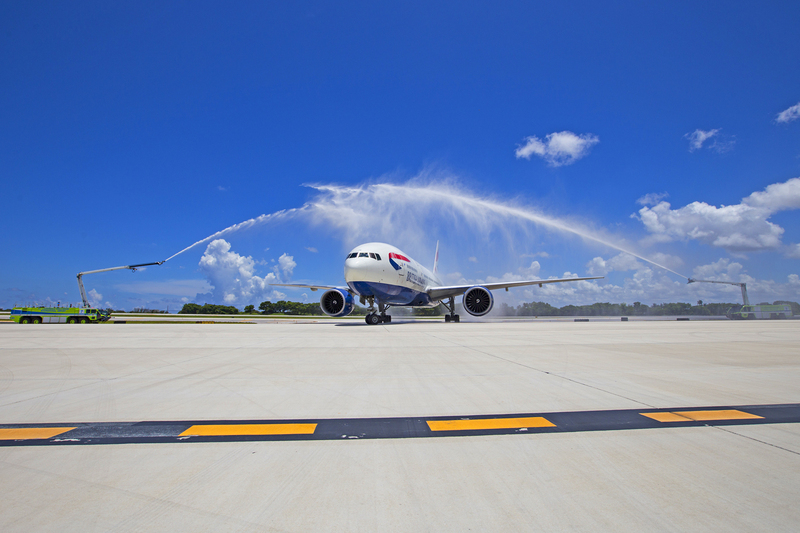 British Airways’ inaugural flight from London to Broward County, Florida arrived at approximately 1:45 p.m. Eastern time July 6, marking the airline’s first scheduled commercial service to south Florida’s Fort Lauderdale-Hollywood International Airport (FLL). 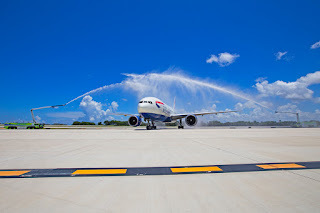 The non-stop flights connecting London’s Gatwick Airport (LGW) to FLL will operate on Tuesday, Thursday, Saturday and Sunday. Connecting through LGW, British Airways’ passengers will be able to reach over 150 destinations around the world. Flights will leave LGW at 9:25 a.m., arriving in Florida at 1:45 p.m. Return flights will leave FLL at 5 p.m., arriving in London at 6:30 the following morning. British will operate a Boeing (NYSE:BA) 777 on the route. According to SeatGuru.com, the aircraft will have 14 open First Class suites with seats that are 22 inches wide and offer 78 inches of pitch. Club World class will have 48 flat-bed seats that are 20 inches wide with 72 inches of pitch. World Traveller Plus, the carrier’s premium economy offering, will accommodate 40 passengers in recliner seats that are 18.5 inches wide with 38 inches of pitch, while 122 standard economy passengers will have seats that are 17.5 inches wide with 31 inches of pitch. Flights in both directions will include entertainment options consisting of movies, TV and audio channels. A complimentary three course meal and beverages will also be served. While not among the world’s most rapacious airlines when it comes to raking in ancillary revenue, British does levy a number of so-called à la carte charges. Ticket prices do not include a payment fee of one percent of the cost of the booking, “up to a maximum of £20 per person, when paying with a credit card or PayPal,” according to the airline’s website. Passengers who do not pay online are assessed a £10 offline service fee on each ticket. Guests must also pay to reserve their seats in advance. On the new route, those charges range from £23 for each flight for seats in the center section to £56 for exit row seats. Passengers who don't want to pay will be able to choose from what's left over from at least 24 hours before the flight except on economy Basic fares, where a seat will be allocated at check-in. For those traveling to the U.K., Gatwick offers several advantages over Heathrow (LHR). While Heathrow is located 15 miles west of Central London, it is the world’s busiest international airport. Gatwick is located 30 miles south of Central London but, in addition to being smaller, is widely regarded as better organized than Heathrow. Two Piccadilly Line Tube stations serve LHR while the Tube does not serve LGW. Heathrow passengers can choose from two train services – the Heathrow Connect and the Heathrow Express – while Gatwick passengers can take the Gatwick Express to Victoria Station. Aside from deals offered to promote this new route, Gatwick might also be less expensive because of government-imposed add-ons, including duties and airport fees. Flying out of the U.K., passengers are assessed an Air Passenger Duty, which is virtually identical between LHR and LGW, but Gatwick’s Passenger Service Charge is substantially less than Heathrow’s; £12.66 compared to £42.06, respectively. Multiply that times two for a round-trip ticket. British Airways, part of International Airlines Group, is the largest international carrier in the U.K. The carrier has its home base at London Heathrow Airport and currently has a fleet of more than 270 aircraft.